A porous carrier having interconnected porosity is loaded with drug or other material for controlled release of the drug or other material. This is a Continuation Application of U.S. application Ser. No. 10/362,314, entitled Use of a Porous Carrier, filed on Feb. 20, 2003, now pending, which is based on International Application Serial Number PCT/GB01/03739, entitled Use of a Porous Carrier, filed on Aug. 21, 2001, which claims priority to GB 0020610.2, entitled Use of Porous Carrier, filed Aug. 21, 2000. The effects of MTX on the proliferation of ostersarcoma cells was measured by MTT assay. The reagents required for this assay were MTT powder (sigma M2128 or M5655), dimethyl sulphoxide DMSO (sigma D2650), and phosphate buffered saline (PBS). The medium was removed from the wells. The MTT solution was made by adding 50 mg MTT to 10 ml of PBS in a universal tube, which was warmed at 37° C. for 15 minutes. 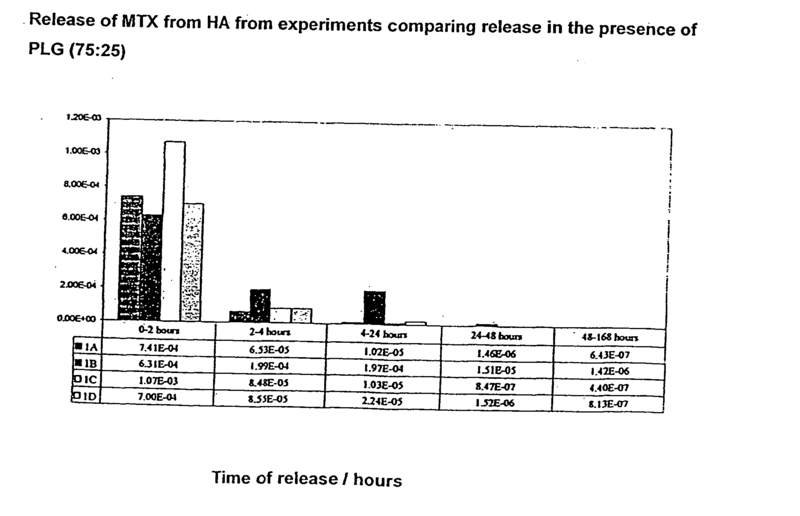 The solution was then filtered and 10μ of MTT added to each well and returned to the incubator for approximately 3 hours at 37° C. and 5% CO 2 and 99% humidity (details on the function and action of MTT can be found in Appendix II). The MTT was removed from by inversion and blotting onto tissue paper. Next, 100 μl of DMSO was added to each well and shaken for 1 minute. The absorbance of each well was then read by a Dynatech microplate reader (BioRad Model 3550) at a wavelength of 595 nm and 5 sec mixing time. These samples could not be re-used and were therefore discarded upon completion of the assay. Once readings were obtained they were tabulated and normalised as a percentage of the control value. 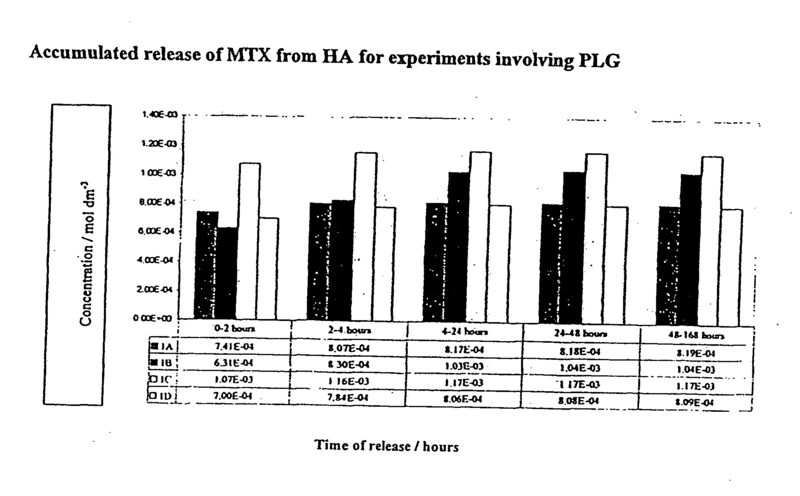 Absorbance readings were analysed against the control values by a Dunnetts' test of significance at the 5% level in order to determine if there was a statistically significant difference in cell proliferation as concentration of MTX rose. Different techniques of loading MTX onto HA discs. Four methods for the absorbance of [Fe(phen) 3][ClO4]2 onto HA were explored, each using blocks of porosity 83.35 (0006) and approximate dimensions 20×15×20 mm, weight 303.5 g. Solutions were prepared by dissolving [Fe(phen)3][ClO4]2 (0.031 mmol) in methanol (30 cm3). All blocks were weighed wet and dried in an oven at approximately 100° C. overnight. 1. Absorbance by immersion of HA in a solution of [Fe(phen) 3][CIO4]2 for 35 minutes. 2. 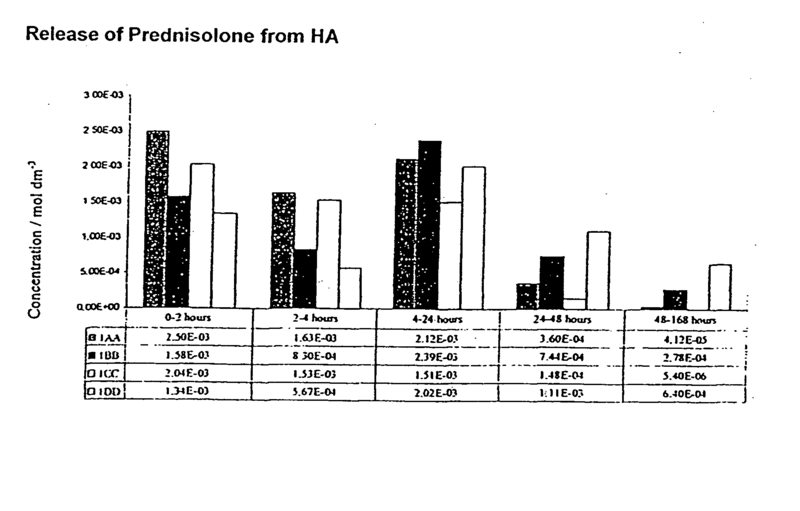 Absorbance by immersion of HA in a solution of [Fe(phen) 3][CIO4]2 for 24 hours. 3. 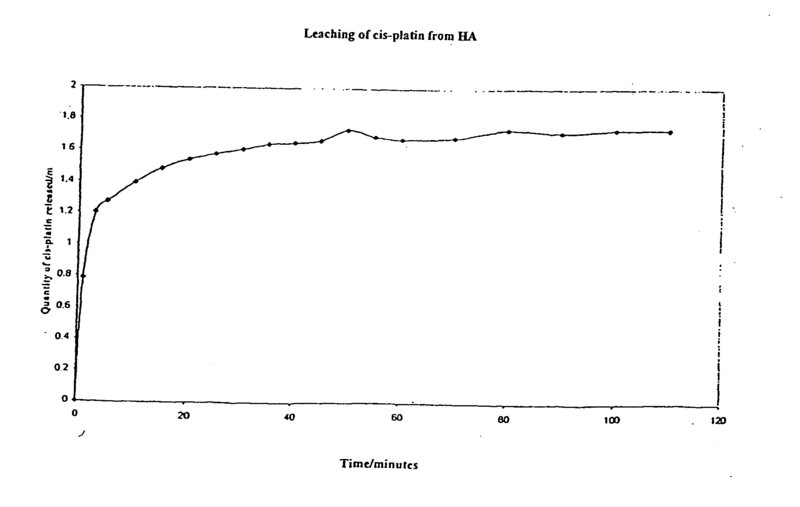 Absorbance by placing HA under vacuum for 10 minutes prior to the direct injection of a solution of [Fe(phen) 3][ClO4]2 onto the block and vacuum maintained for a further 30 minutes. 4. Absorbance by immersion of HA in a solution of [Fe(phen) 3][ClO4]2 and the application of a vacuum for 35 minutes. Half of the block prepared in method 3 was immersed in distilled water (30 cm3) and the absorbance recorded by UV-Vis spectrometry at wavelength 512 nm. An extinction coefficient of 10,620 mol −1 dm3 cm−1 was used in all calculations. The graph below shows the quantity of [Fe(phen) 3][ClO4]2 released from the block over time. 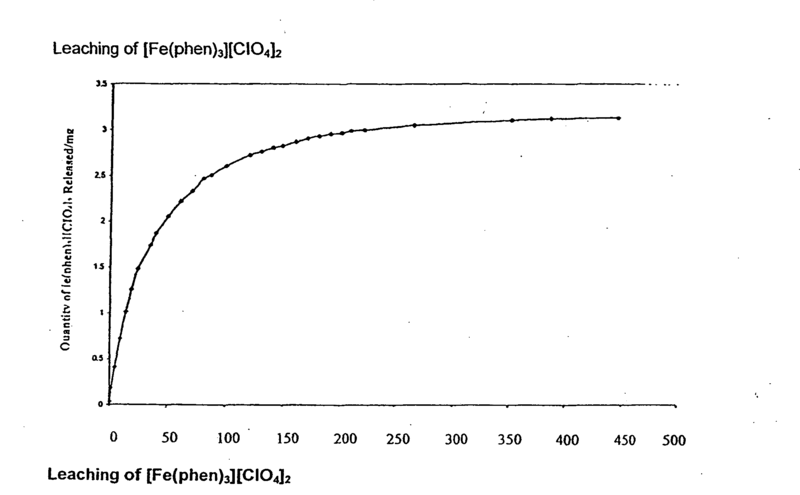 The graph shows two phases which are likely to correspond to the initial release of surface absorbed [Fe(phen) 3][ClO4]2 followed by release of [Fe(phen)3][ClO4]2 from inside the block. Almost all [Fe(phen)3][ClO4]2 is released from the block after 170 minutes. After 330 minutes the solution is replaced with distilled water and the absorbance measured after a further 20 hours. The reading revealed the release of a further 0.14 mg from the block, this may be due to the release of [Fe(phen)3][ClO4]2 which was inside the block when the system reached equilibrium during the first 330 minutes. Vacuum method 3 was used for loading the compounds onto HA, again blocks of porosity 83.35% (0006) were used with approximate dimensions, 20×20×15mm, weight 3.6-3.8 g. For the control block with just [Fe(phen) 3][ClO4]2 (0.01 g, 0.013 mmol in 6 cm3 acetonitrile), good penetration into the block was observed. 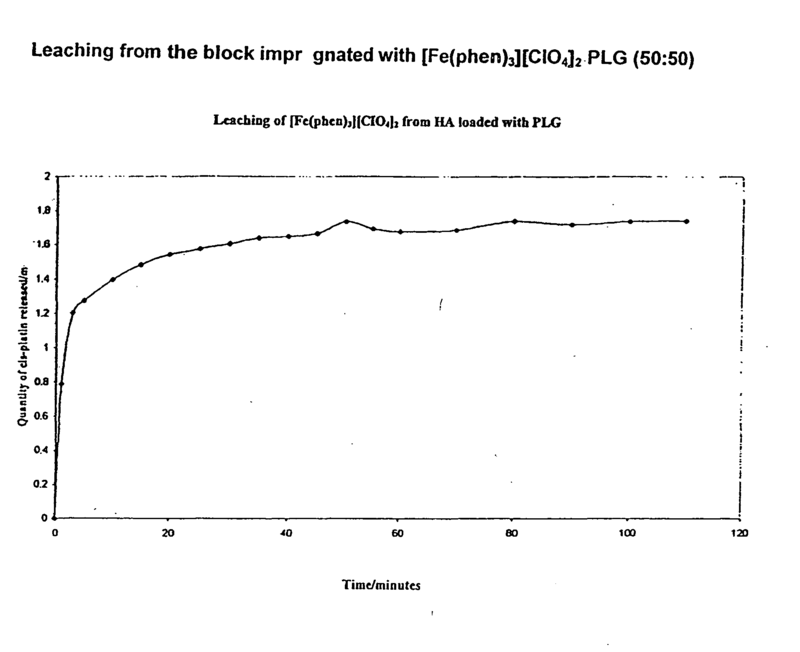 For the block loaded with [Fe(phen)3][ClO4]2 (0.01 g, 0.013 mmol) and PLG (50:50) (200 mg in 6 cm3 acetonitrile) less penetration was observed but distribution was more uniform. Again the blocks were dried in the oven. (In order to fully dissolve the polymer in acetronitrile stirring for up to 1 hour is required before loading). Approximately all [Fe(phen) 3][ClO]2 is released after 300 minutes. Further readings were taken after 24 hours and the observed absorbance decreased. After a further 48 hours most complete disappearance of colour was observed. 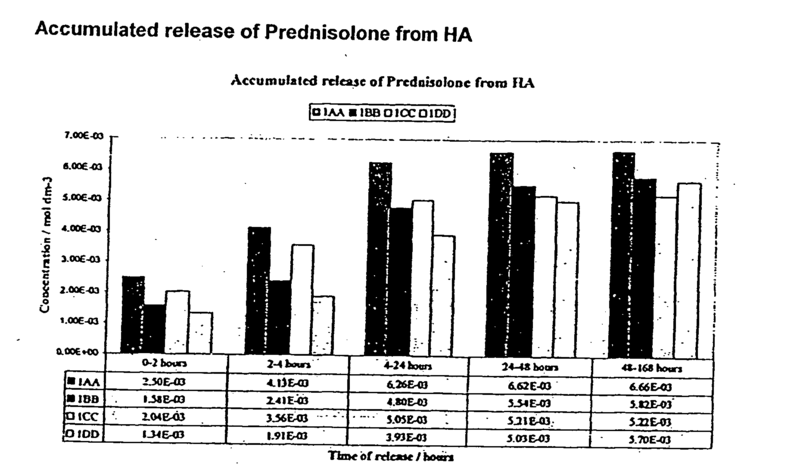 This may be due to the hydrolysis of the [Fe(phen)3][ClO]2 by the HA block. The quantity of [Fe(phen) 3][ClO4]2 absorbed onto HA is increased by the application of a vacuum during loading. 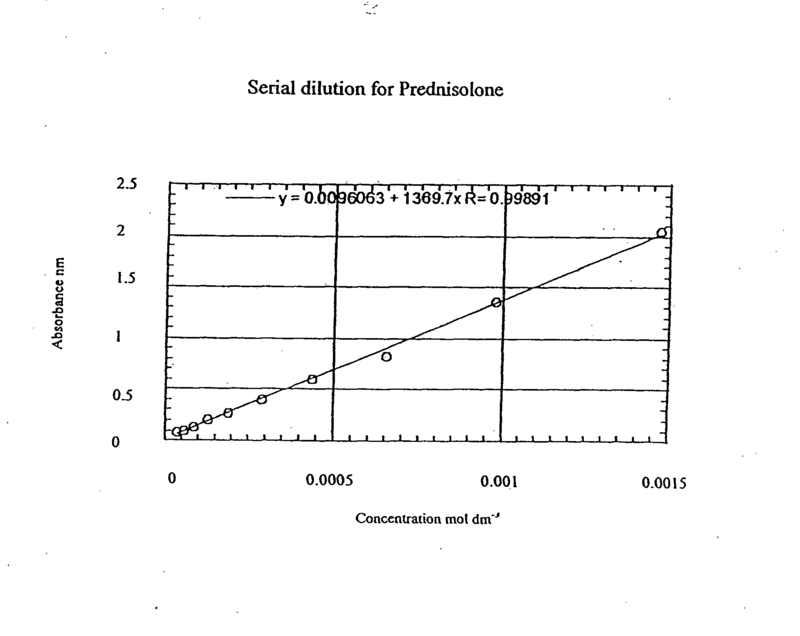 Increased penetration is observed when acetonitrile is used as the solvent rather than methanol. The release of [Fe(phen) 3][ClO4]2 from HA proceeds by an initial burst (due to release of the complex from the surface of the block) followed by a slower phase (release of complex from within the block). The overall release is fast with the majority of complex released after 300 minutes. 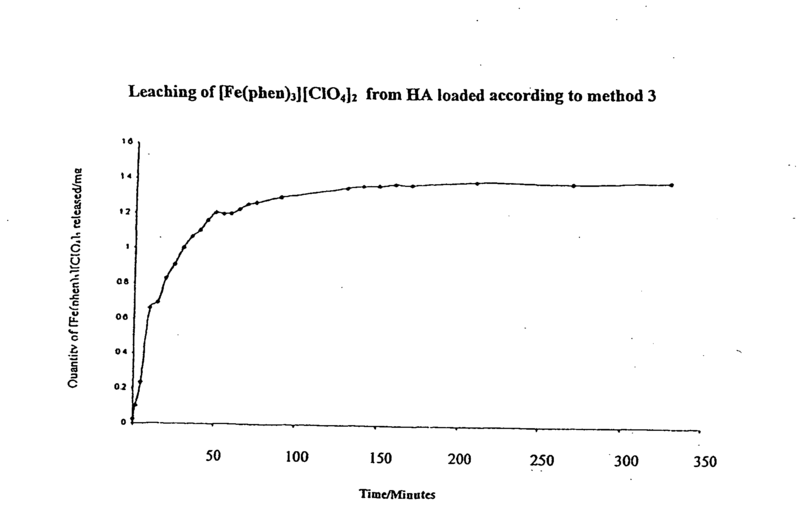 The impregnation of HA with a mixture of [Fe(phen)3][ClO4]2 and PLG dramatically slows the release of [Fe(phen)3][ClO4]2 with continuing release of the complex observed even after 5 days. Leaching experiments were carried out in distilled water (35 cm 3) with stirring, in the absence of light and closed to prevent evaporation. Absorbance was recorded at λ 206 nm at appropriate intervals and all caclulations required the extinction coefficient 3057 mol−1 dm3 cm−1. Since PLG is not soluble in water and cis-platin is not soluble in acetonitrile, a two-phase loading programme was undertaken. Using vacuum method 3 cis-platin (0.025 g, 0.08 mmol) was initially loaded onto the block in an aqueous sodium chloride solution (50 cm 3 of a 0.9% by weight solution). After drying the block in an oven overnight the vacuum method was again used to inject a solution of PLG (85:15) (0.105 g) in acetonitrile (50 cm3). Again the block was oven dried overnight. 38. A preformed porous ceramic carrier comprising an Interconnected skeleton having pores the majority of which are in the range of from about 20 to about 800 micron, the carrier having a density of less than about 40% theoretical, the pores containing a second material deposited therein, the rate of release of the second material from the carrier being controlled. 39. A carrier according to claim 38, wherein the skeleton is made up of scaffolding and struts. 40. A carrier according to claim 38, wherein the skeleton has average pore sizes in the range of 20 to 800 micron. 41. A carrier according to claim 40, wherein the average pore size is in the range of 60 to 800 micron. 42. A carrier according to claim 41, wherein the micropores were formed by sintering a precursor of the carrier under conditions which were below those required for full sintering. 43. A carrier according to claim 38, wherein the skeleton is formed of a biocompatible material. 44. A carrier according to claim 38, wherein the density ranges from about 10% to about 30% of theoretical density. 45. A carrier according to claim 38, wherein the pores contain any one or more of: growth factors; antibiotics; vitamins; proteins; hormones; a chemotherapy agent; or a radio opacifying agent, or the like. a bone forming or bone degrading cell. 47. A carrier according to claim 45, wherein the chemotherapy agent is Cisplatin. 48. A carrier according to claim 45, wherein the radio opacifying agent is strontium −67 or samarium −153. 49. A carrier according to claim 45, wherein the agent is MTX. 50. A carrier according to claim 38, wherein the pores contain one or more of Werner-type co-ordination complexes; macrocylic complexes; metallocenes and sandwich complexes and organometallics. 51. A carrier according to claim 38, wherein the surface of the pores has been modified to control release of the second material. 52. A carrier according to claim 51, wherein the surface of the pores has been modified by treatment with acid or alkali or plasma or chemical vapour deposition. 53. A carrier according to claim 38, wherein the pores contain the second material in a degradable support, e.g. a biodegradable support. 54. A carrier according to claim 53, wherein the biodegradable support is a collagen or polymer. 55. A carrier according to claim 53, wherein the support is PCPP.SA, PCC, CPP.SA, FAD-SAPTMC, PM. 56. A carrier according to claim 53, wherein the pores contain layers of second material and biodegradable support, each layer being different from its neighbour or neighbours. 57. A carrier according to claim 53, wherein the pores contain material in, layers, arranged as alternating layers of agent-free layer and of agent-containing layers or by the concentration of agent across different layers of collagen or polymer. 58. A carrier according to claim 38, wherein the carrier has a degree of reticulation high enough to reduce the pressure gradient generated in infiltration of the second material into the pores of the carrier. 59. A carrier according to claim 38, wherein the second material is introduced into the pores by one or more of a centrifugation, immersion, vacuum impregnation or freeze drying technique. 60. A carrier according to claim 38, wherein the exterior surface thereof has been coated with a biodegradable polymer containing a drug. 61. A carrier according to claim 38, wherein the skeleton of the ceramic carrier is formed from a metal or non-metal oxide or the like. 62. A carrier according to claim 61, wherein the ceramic skeleton is partially or fully resorbable. 63. A carrier according to claim 62, wherein the skeleton is formed of calcium phosphate hydroxyapatite. 64. A preformed porous ceramic carrier comprising an interconnected skeleton having pores the majority of which are in the range of from about 20 to about 1000 micron, the carrier having a density of less than about 40% theoretical, the pores containing MTX, the rate of release of the MTX from the pores being controlled. 65. A carrier according to claim 64, wherein the MTX has been loaded into the pores by centrifugation and/or freeze drying. 66. A preformed ceramic carrier comprising an interconnected skeleton having pores the majority of which are in the range of from about 20 to about 1000 micron, the carrier having a density of less than about 40% theoretical, the pores containing Fe(phen)3[ClO4]2 the rate of release of the Fe(phen)3[ClO4]2 being controlled. 67. A carrier according to claim 66, wherein the Fe(phen)3[ClO4]2 has been loaded into the pores by vacuum impregnation. 68. A preformed porous ceramic carrier comprising an interconnected skeleton having pores the majority of which are in the range of from about 20 to about 1000 micron, the carrier having a density of less than about 40% theoretical, the pores containing Fe(phen)3[ClO4]2 and a glycolide, the rate of release of Fe(phen)3[ClO4]2. 69. A preformed porous ceramic carrier comprising an interconnected skeleton having pores the majority of which are in the range of from about 20 to about 1000 micron, the carrier having a density of less than about 40% theoretical, the pores containing Cisplatin, the rate of release of the Cisplatin being controlled. 70. A preformed porous ceramic carrier comprising an interconnected skeleton having pores the majority of which are in the range of from about 20 to about 1000 micron, the carrier having a density of less than about 40% theoretical, the pores containing Cisplatin and a glycolide, the rate of release of the Cisplatin and a glycolide being controlled. 71. 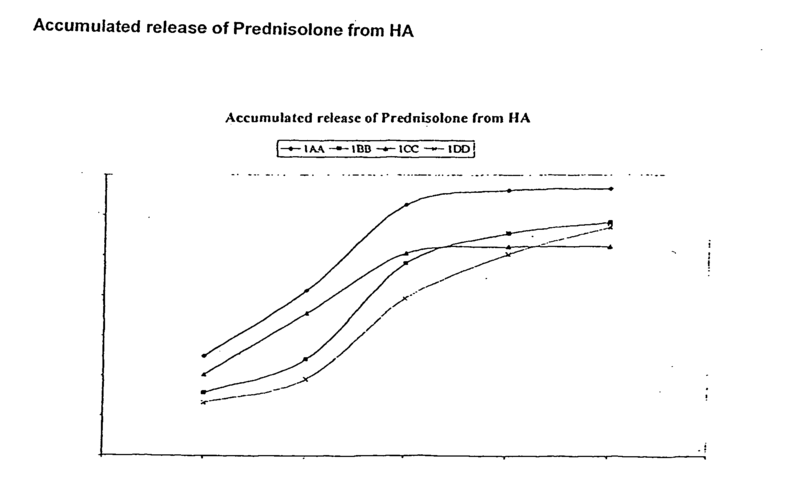 A preformed porous ceramic comprising an interconnected skeleton having pores the majority of which are in the range of from about 20 to about 1000 micron, the carrier having a density of less than about 40% theoretical, the pores containing prednisolone, the rate of release of the prednisolone being controlled. 72. A carrier according to claim 38, shaped for orthopaedic, maxillo-facial, or cranio-facial replacement. 73. A carrier according to claim 38, shaped for location at an intramuscular site, interperitoneal site, subcutaneous site, central nervous system or occular site. 74. A carrier according to claim 38, wherein the pores contain a general chemical or resin or petroleum derivative or explosives. ES2404733B2 (en) * 2011-10-05 2013-09-17 Universidad De Extremadura Hybrid bioactive scaffold, method of manufacture and use for bone tissue engineering. ES2245644T3 (en) 2006-01-16 Bioglass compositions derived from sol-gel containing silver.